Children delight in the tiniest treasure. Spider webs, dew drops, a crawling bug, colored pebbles. What an incredible opportunity we have to take our children into the woods, teach them about the joy of nature. There is a real joy in discovering nature, on a kid's level. The main thing to consider when hiking with babies and kids, is that you will have to modify your goals; whether it is in choice of destination, mileage, or environment. When you go hiking with a baby or a toddler, you will have lots of extra gear, plus be carrying the kid. That's when you pick a location that's easy to get to, kid friendly, and not too far in. Start by teaching your children about safety in the outdoors. Simple rules are good. For example, "no running and always keep in sight of me" might be a good place to start. Give them their own safety whistle and the beginnings of the essentials in their pack: a snack, some water and a spare layer. "Hug a tree" and stay put. Hug a Tree is an excellent program, with lots of good ideas on how to "woods proof" your small kids: what to do if they get lost, and so on. Help their searchers by answering their calls. Carry a garbage bag and whistle to help alert rescuers. Other things to consider are altitude, sunburns, knee scrapes, bee stings. Just be aware and prepared. Keep an eye on your children. Keep the children close to you. Don't let your kids play unattended on the trail. Make lots of noise. Just like bears, cougars will often retreat if given the opportunity. Walking in large groups and making noise will give the cougar the chance to retreat and reduce the likelihood of a sudden encounter. Be cautious at dusk and dawn. Most predators are most active at dusk and dawn. This is a time to be especially cautious. Keep your pets at home. 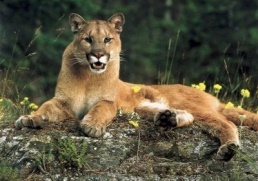 Cougars can easily kill the largest dog and hiking with your pet may prompt an attack. If you do take your dog out with you, be sure to keep your dog on a leash. Pets running free may provoke a cougar, and then lead it to you. Remember, cougars are very different than bears. Cougars do not bluff charge. Playing dead is never recommended in a cougar attack. Don't Run. Running may trigger an attack. Face the Cougar and retreat slowly. Keep direct eye contact with the cougar while you slowly retreat towards safety. Look larger than life. Raise your arms above your head to make yourself look larger than normal. This may help to intimidate the cougar. You may also want to throw rocks and yell at it. Aggression will often scare it off. Pick up your small children. Cougars will often select smaller prey, such as children or pets. Pick your children up to discourage the attack. Consult a guide book and map before doing a hike. A Northwest Forest Pass or Discover Pass may be required for each vehicle parked at the trailhead. Dogs must be on a leash on most trails. Don’t leave valuables anywhere in your car. Always leave your itinerary with a family member or friend. Hike with a friend: hiking with others increases security. Maps and Guide Books Green Trails trail maps and the Issaquah Alps Trail Club's Trail Guide Books are sold through selected outdoor retail stores, such as REI. Detailed hiking information can be found in "55 Hikes around Snoqualmie Pass" by Harvey Manning, with photos by Ira Spring. Whether it's training, nutrition counseling, weight loss issues or any other questions, I'd be more than happy to help. Just contact me! You can also visit my FAQs page to get answers to some of the most common questions I receive. Whatever your location, Maria offers a wide variety of remote coaching and counseling. Learn more about what makes Maria far different than any trainer you may have worked with in the past. Always interesting and informative. Get on Maria's monthly newsletter list. Enjoy Maria's educational and informative videos on everything health and nutrition related! Copyright © 2019 Active Nutrition, Sammamish, WA. All rights reserved.